The Department of the Navy (DON) announced it will make the largest investment in renewable energy by an federal entity. 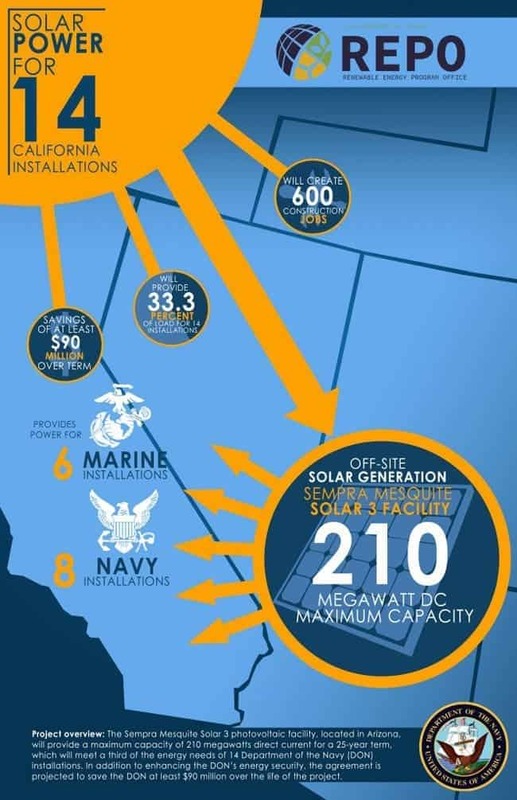 Its plan is to install a huge 210 megawatt (MW) solar facility – enough to power 80,000 Californian homes – in the Arizona desert, which would serve electricity to 14 US Navy installations. The agreement was signed last month and marks the latest in a slew of measures meant to make the Department of Defense less dependent on oil – not just by the navy, but also the military or air force. The Mesquite solar farm will be built on the American Sun Belt, a generic term meant to describe the southern states of America rich in sunshine, with a growing population, yet with plenty of unproductive or barren soil. 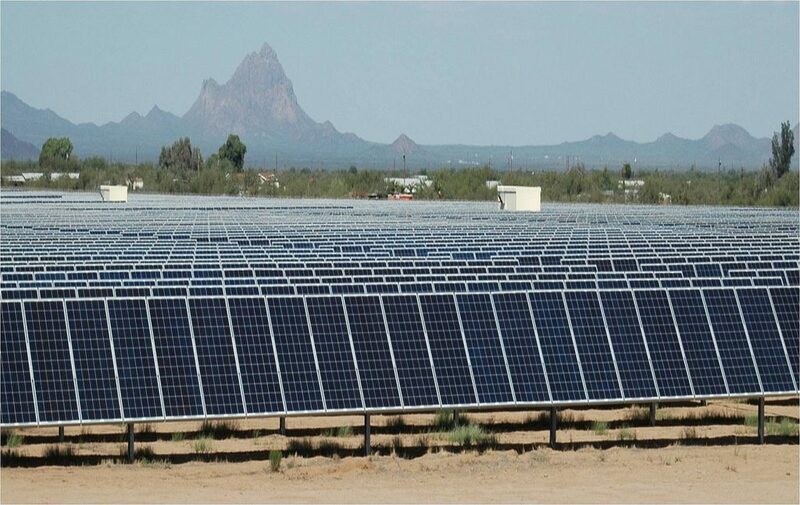 Here the solar farm will take advantage of 300 days of sunshine, all while not disturbing anyone – it’s the Arizona desert after all. Elsewhere installing 650,000 solar panels might have been a problem, as featured on our pros and cons of solar energy checklist. According to Secretary of the Navy Ray Mabus, the project will save the Navy around $90 million during its 25-year-long duration. It will also prevent 190,000 tons of greenhouse gases spewing into the atmosphere each year, the equivalent of taking 33,000 cars off the roads. That’s impressive for sure, but wait until you hear more facts about solar energy. “The collaboration on Mesquite Solar 3 is a triumph of innovative problem solving, and will help to increase the DON’s energy security by diversifying our power portfolio and improving energy efficiency,” said Mabus at the ceremony with Western and Sempra U.S. Gas & Power. Secretary Mabus is a keen supporter of renewable energy, seeing not only the strategic benefits but also its importance to fostering a better planet. At the end of the day, the Navy has to have something left to protect. For instance, Congress mandated the Department of Defense to source 25% of its energy needs from renewable energy by 2025. For Mabus this hasn’t been a problem. He even raised the stakes by requesting the Navy procures at least 1GW of energy by 2015. Standing at 210 MW, the Mesquite solar farm joins other projects like the 17 MW installation at Camp Lejeune, North Carolina or 42 MW at Kings Bay, Georgia, among others. In total, 2015 will see the Navy procure 1.2GW of energy in 2015 – way ahead of schedule. When completed Mesquite will be one of the largest in the world, but not long after it will start generating energy the installation will be dwarfed by its Californian neighbor: the Blythe Mesa Solar project in California. Blythe Mesa will generate 485 MW of solar energy, part of President Obama’s Climate Action Plan to reduce carbon pollution, increase jobs, and push the US economy towards clean energy sources. All over the world governments are planning massive solar farms, taking advantage of their very own sun belts, India and China in particular. India, for instance, wants to build an incredibly massive 750 MW solar plant on a barren wasteland located in the state of Madya Pradesh. According to Rajendra Shukla, the Indian minister of energy, the plant should be up and running in 2017. Construction has yet to begin.